Book collecting has long been a popular hobby, and it continues to grow in popularity. This revised and updated edition of "The Official Price Guide to Books" has everything a book collector needs. It features black-and-white photographs and includes an eight-page color insert of exceptional book covers. 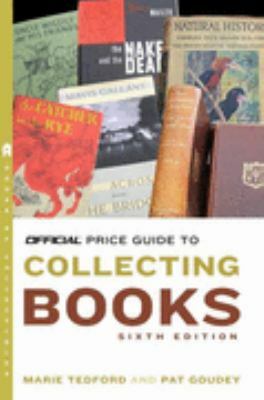 "The Official Price Guide to Books "also includes: - A history of the book trade - Current market review and forecast - Thousands of price listings covering hundreds of years of first editions - Information about genre-collecting - Advice on maintaining your collection - Expert instruction on how to profit from bibliophilia - A handy glossary and recommended reading listTedford, Marie is the author of 'The Official Price Guide to Collecting Books, 6th Edition', published 2008 under ISBN 9780375722936 and ISBN 0375722939.